JEE Main 2019 Notification Ralease: Admit Card, Exam Date, Centres, Syllabus, Pattern, Cutoff - Check your Preference here! HomeJEE MAINJEE Main 2019 Notification Ralease: Admit Card, Exam Date, Centres, Syllabus, Pattern, Cutoff - Check your Preference here! JEE Main 2019 admit card will be released on 17th December 2018. The examination will be conducted twice in a year by NTA. The application form for April 2019 session will be released from 4th February 2019. It is a national level entrance examination. NTA organizes it to offer admission to B.E/B.Tech and B.Arch/B.Plan courses. NITs, CFTIs and various other colleges and institutions of India consider the JEE Main scores for providing admission. For admission in IITs & ISM Dhanbad, students have to qualify both examinations, i.e. JEE Main and JEE Advanced. JEE Main 2019 Mock Test has been released now. 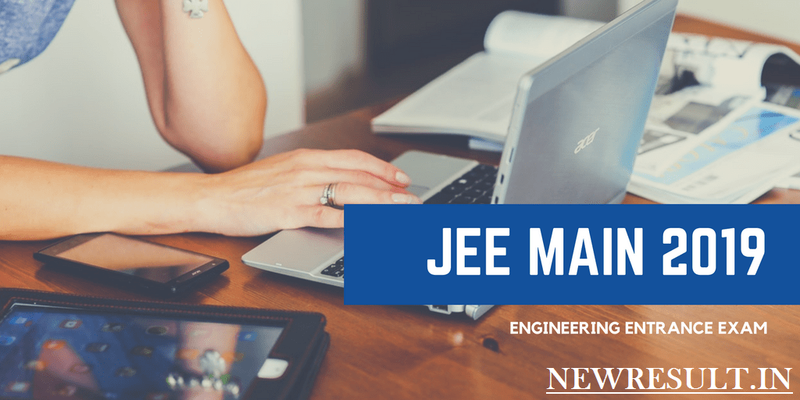 Check JEE Main 2019 latest news about application form, eligibility, exam date, exam centres, pattern, admit card and syllabus. JEE Main 2019 Application Form (April Exam) will be released on 8th February 2019. From the year 2019, JEE Main 2019 examination will be conducted in online mode (computer based exam) by NTA (National Testing Agency) twice in a year – News Confirmed. The candidates had four choices as exam centres/city at the time of registration. The allotted exam centre along with date & shift has been released by NTA. You can check it through the link given above in the notification section. The authority also provide JEE Main slot booking facility along form filling. The admit card will be provided on 17th December 2018 (for January session) and 18th March 2019 (for April session). For online mode exam, students can also book their slot. Candidates have to bring any one photo ID proof along with the admit card. Type of Questions (Paper 1): The question paper will comprise of objective typequestions. The JEE Main syllabus contain topics from the 11th and 12th class of CBSE, ICSE and other state boards. Syllabus for paper 1 contain physics, chemistry and mathematics. The syllabus pdf is available with the release of application form on official website. It will be released along with the results in the month of February 2019. JEE Main cut off will be the minimum marks that need to have to appear in the All India centralize counselling. JEE Main application form 2019 is available from 1st September 2018 (Jan exam). Photograph size should be 10KB – 100KB and size of signature should be 4KB – 30KB. Fee will not be accepted through DD, money order, IPO, etc. Year of Appearance Candidates who have passed 12th exams in 2016 are not eligible to apply. Students who have appeared in 12th exams in 2016, did not pass in 2016 but passed in 2017 are not eligible to apply. The correction facility is provided provided from 8th – 14th October 2018. After the few days of completion of examination, the answer key will be published through the website. It will be released in the month of January 2019. JEE Main answer key will be released along with images of OMR sheets. If candidates are not satisfied with the answer key they can challenge it. Candidates have to fill an online application and have to pay Rs. 1000/- per question to challenge the answer key. Fee payment can be done through debit/credit card. Students who will appear in the exam can check the result within a month after the examination. Here we have mentioned details about the result date, mode, etc. JEE Main result will be provided on 31st January 2019 for January session and 30th April 2019 for April session. Students will be able to check the result only through online mode. The result will be published in the form of percentile. Percentile will be calculated as per the marks obtained in the JEE Main exam (session wise). It will also comprise All India Rank and All India Category Rank. JEE Main score card will not be dispatched to candidates, it can be downloaded from official website. If you have any other queries related to that you can comment below on comment box,our team will soonly update you.